The primary cost of forming an LLC is the state filing fee, which ranges between $40 and $500, depending on your state. In addition, you will also need to pay annual fees to maintain good standing of your LLC. If you choose to use a service provider to help form your LLC, you will face additional costs on top of the State filing fee. When forming an LLC yourself the only cost you are responsible for is the state filing fee. However, a handful of states also require a publication fee or a name reservation fee. Here is a breakdown of all the costs you can expect to see. 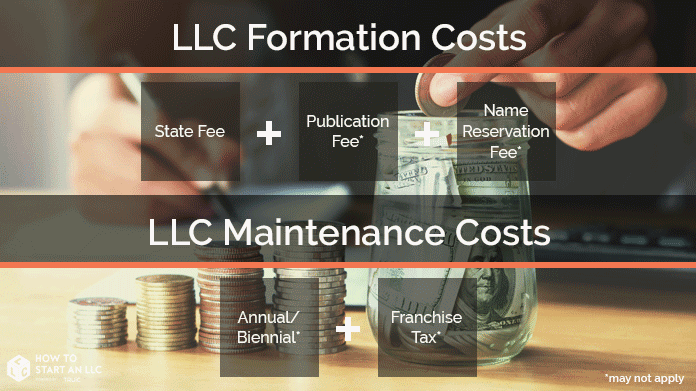 The main cost when forming an LLC is typically the fee of filing your Articles of Organization with the State. This fee ranges between $40 and $500, depending on your state. Several states (Arizona, Georgia, Nebraska, Nevada, New York, and Pennsylvania) also require your newly incorporated LLC to publish a statement of formation in a local newspaper. Publishing costs can be anywhere between $40 and $2000, depending on your state’s specific requirements. If you’re forming an LLC in Alabama, you will also need to reserve your LLC’s name for a small fee of $10-$28. Reserving a name is optional for all other States. The rule of thumb is that you should always form your LLC in the state where you plan to conduct business. Otherwise you may end up with additional unwanted costs and paperwork. For more information, read our article on the topic. 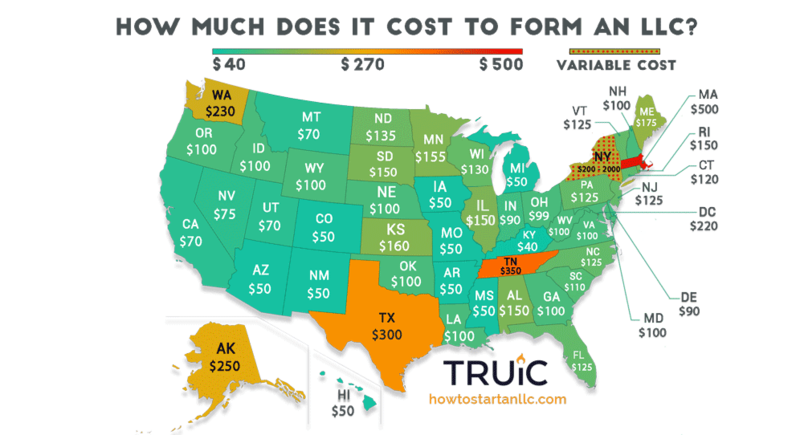 For a full list of costs by State view the table below. Most states require LLC's to submit an annual or biennial report which includes updating the name, address, and ownership of the LLC. The report fee varies state by state. Some states levy a yearly tax on LLC's, often called a franchise tax. This is most often a flat tax, but can also vary according to your LLC's annual earnings in certain states. The table below lays out all the filing fees in each State as well as what the ongoing costs include. For a more detailed report click the State name, you will be directed to our Form an LLC page.